Record this day in history as the start of a true fairytale! 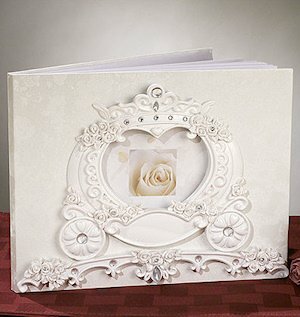 Our 8" by 10" Cinderella guest book features a gorgeously detailed poly resin wedding coach image on the cover. Exquisite design features crystal embellishments and the center of the coach has an opening with a single white rose. Search for "Wedding Coach" on our site for coordinating items to carry the fairytale theme throughout your event. Guest book is packaged in a plain gift box. Hi I was wondering if I can put my own picture in the carriage instead of the picture of the rose? 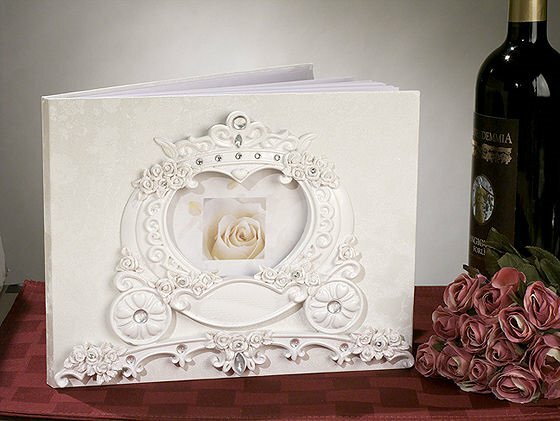 This Wedding Coach Cinderella Guest Book will arrive with a white rose and we can't alter that as it's shipping directly from the supplier but it has an opening and you will need to manually put the picture in. Is the guest book CI-14162 just have lines on it for the guest to sign in or there is a space to put wishes on it? How many pages are in it? how many pages is this book? Is there space to write wishes or just lines for guest to just write their names? There are 50 pages lined and it holds 960 signatures only.